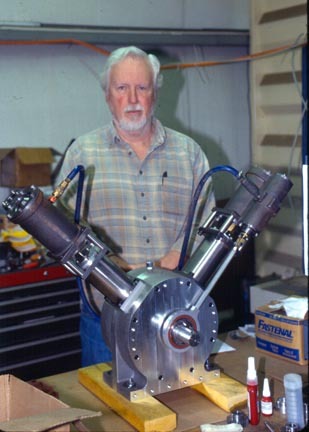 Mike Brown of Springfield, Missouri is the only person in America making steam engines commercially, albeit in small batches. Mike paid an MIT engineer to design the 20 hp V-2 and so it is quite well and conservatively designed. It is a 3x4 engine, piston valved, and should be able to make close to 80 hp. Mike wanted an engine that would last forever so it was understressed and de-rated at 20 hp. 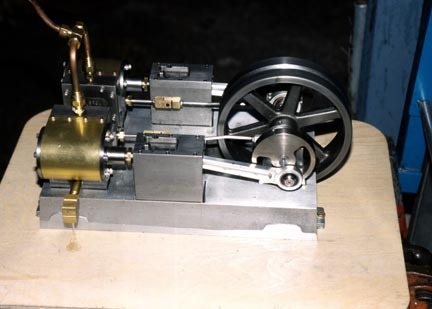 The smaller horizontal two cylinder mill engine is a standard old fashioned slide valve engine and thus of modest performance and efficiency. We are not certain of the cutoff designed into the big V-2. That may need to be adjusted by the buyer. It is good to have a long enough cutoff for self starting but a shorter one so that some efficiency takes place. We are not sure if Mike has run his engine on steam or on a dynamometer. It will need a lot of things before it works: oil injector pump, water pump, throttle, condenser, boiler, steam safety blow off valve, oil-water separator, and probably a few other things, such as pressure gauges and temperature gauges and fuel pumps. It is a good start and better than most things available today.